Denny’s is heating up the new year with several new, affordable dishes that you will not want to pass up. Introduced nationwide recently, a fresh, new and budget-friendly lineup of Denny’s all-new Buttermilk pancakes have been added to Denny’s already impressive $4 Value Menu, which also includes the diner’s famous $4 All You Can Eat Pancakes offer. The new offerings feature a variety of pancake breakfasts that are also available in $4 Short Stacks, including the New Super Blackberry Breakfast. 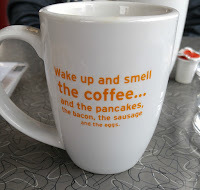 $4 Everyday Value Slam® - Two buttermilk pancakes, two eggs cooked to order and two bacon strips or two sausage links. 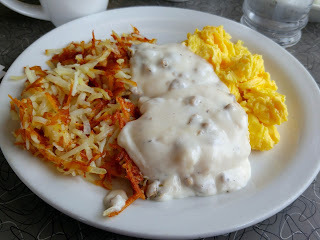 $4 Biscuit & Gravy Breakfast - A warm open-faced biscuit smothered with rich sausage gravy. Served with two eggs and hash browns. $4 All You Can Eat Pancakes - They start you off with three fluffy buttermilk pancakes and then deliver them hot, two at a time, until you’ve had your fill. Restrictions may apply. Going out as a family can get expensive! 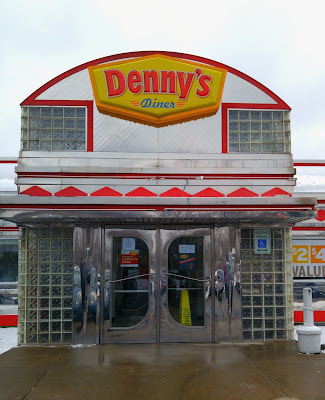 Well the folks at Denny's wants everyone to get a great meal for a super affordable price. Denny’s value menu offers meals priced at $2, $4, $6 and $8. Perfect for every budget and family size... let alone any appetite size! No more having to share meals with your kids! At these prices they can get their own meal! 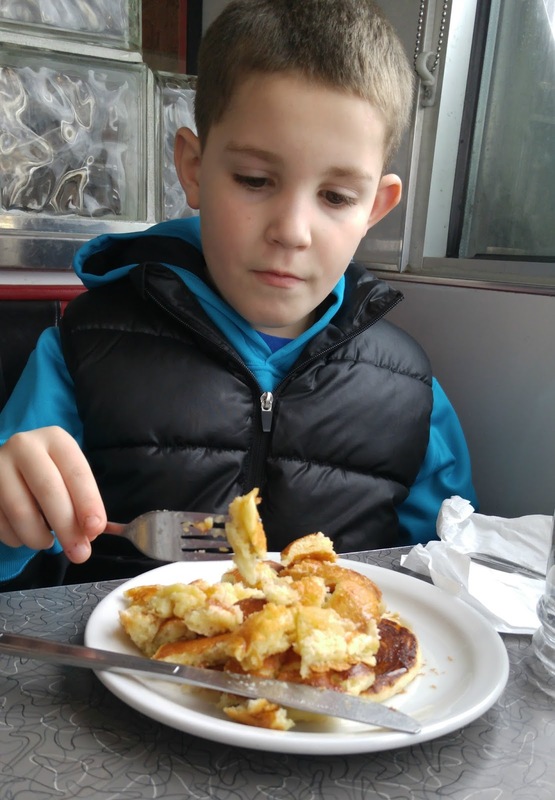 Both my children opted for the All You Can Eat Pancakes. 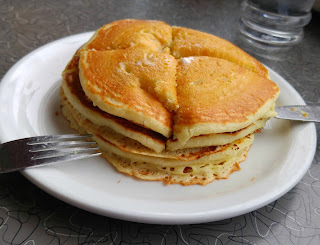 They bring out three large piping out buttermilk pancakes and then if you want more, they bring out two at a time. Right after our waitress dropped off their plates, she said she would immediately put another order in for the kids. The service was just as amazing as the pricing! Denny’s value menu makes it easier to eat out on a budget with the whole family! 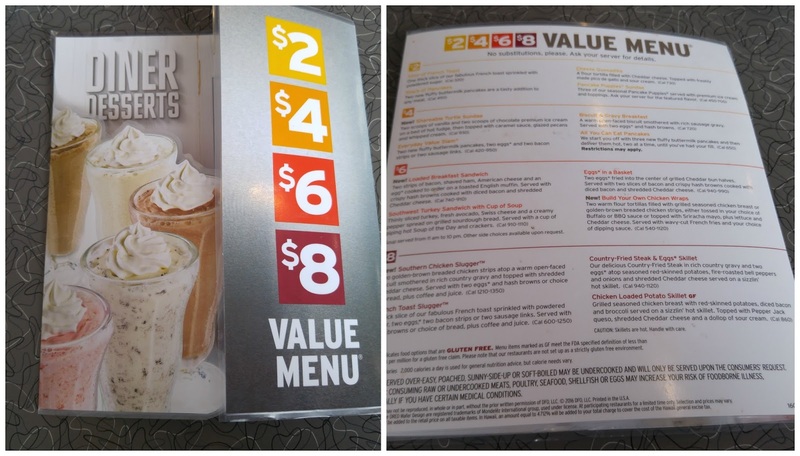 Next time you are looking for a night out with the family, why not check out Denny's value menu!